How to Train Your Self-Driving Car! Michael Kroepfl relocated to Seattle from Graz, Austria in 2009, where he worked for Microsoft as part of the team building Bing Maps. After arriving, he continued to work at Microsoft in the Bing team developing algorithms for mobile computer vision and camera-based search. 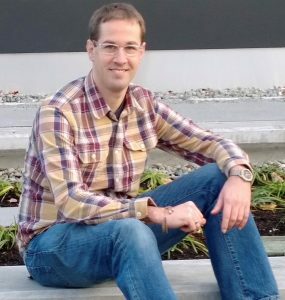 Later he was one of the early team members at Microsoft working on HoloLens*, before he joined NVIDIA in 2017 as a Principal Computer Vision Scientist. Michael is currently working in the autonomous driving team developing algorithms for mapping and localization. Michael holds a PhD degree in Computer Vision from Graz Technical University and a MSc degree in Robotics from University of Applied Sciences Campus 02 in Graz. Note: *HoloLens is the first self-contained holographic computer, enabling you to engage with your digital content and interact with holograms in the world around you. You can modernize your business with mixed reality, experiencing a new dimension of creativity and teamwork using mixed-reality business applications from Microsoft Dynamics 365. Rich Martin began the morning with a prayer. Jim Gordon then led us in the Pledge of Allegiance and introduced our guest Quincy, Andrew Face’s daughter. 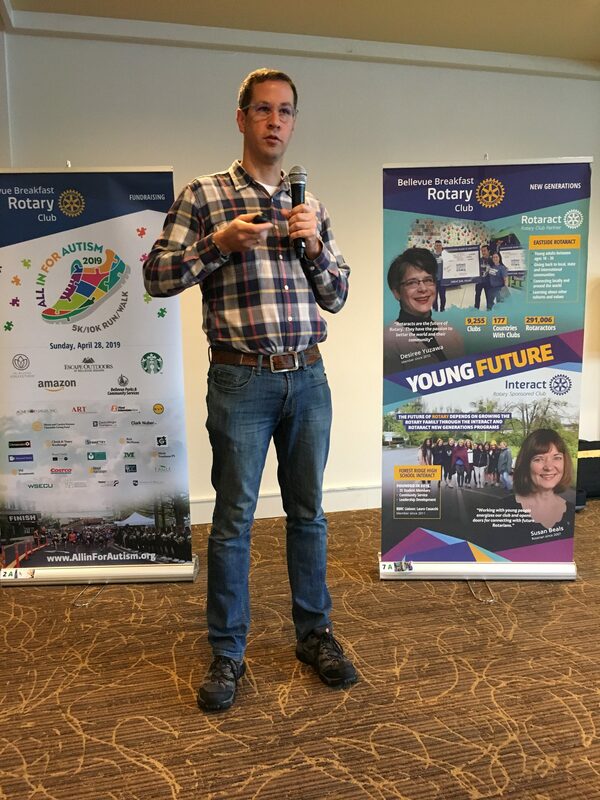 Tonya Franzen-Garrett made an announcement about the adoption party and how we are in partnership with the Bellevue Noon Rotary who also does an adoption party. Their party is on March 23rd. They need drivers. She reminded us that the Noon Club helped our club and we should return the favor. Wendi Fischer then asked some of the newer members to come to the front of the room to play a game. The members told the audience their names, occupation, and what they were involved with in the club. The audience then got to guess each newer member/contestant’s dream job. This was a fun ice breaker that caused a few laughs. We then recognized some Birthdays and sang Happy Birthday to Laura Cosacchi. Chris Boland then reminded all of us to park in the top lot. Wendi Fisher made an announcement to have all red badge members gather at the end of the meeting to review the necessary steps in order to obtain a blue badge. Michael then described the different levels, 0-5, of “Human vs Machine”. Level Zero means no active assistance system for the vehicle. Level 5 would be no driver and fully automated. Hands off and eyes off the road vehicles such as today’s Tesla’s are a level 3. Autonomous driving requires sensors and algorithms. Some of the features are camera based perception, ultrasound, radar, lidar, IMU, GPS and odometer. Lidar based mapping and localization is also used. Engineers learn from video games (virtual vs real world). Simulating is important before real world driving. When will cars be driving automatically? A: Not yet primarily due to the cost which is estimated at $500,000 for a car. Who will win the race? A: Not sure as many companies are working on this. How do AV vehicles work in the snow? A: Engineers are still working on this as snow flakes are difficult for the sensors. When will Artificial Intelligence completely take over? A: Nobody knows. Chris Boland then closed the meeting with the thought of the day.